We finally have some snow that looks like it’s going to stay. 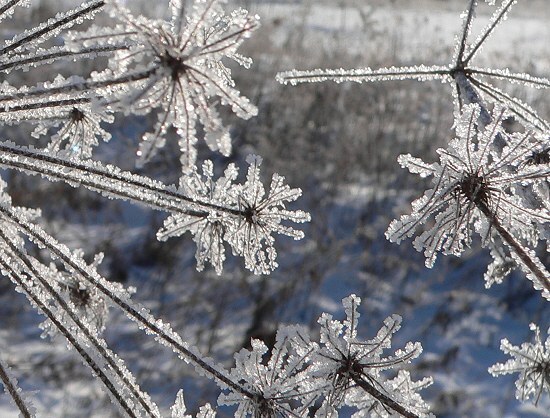 We’ve had several small storms and some very cold days. 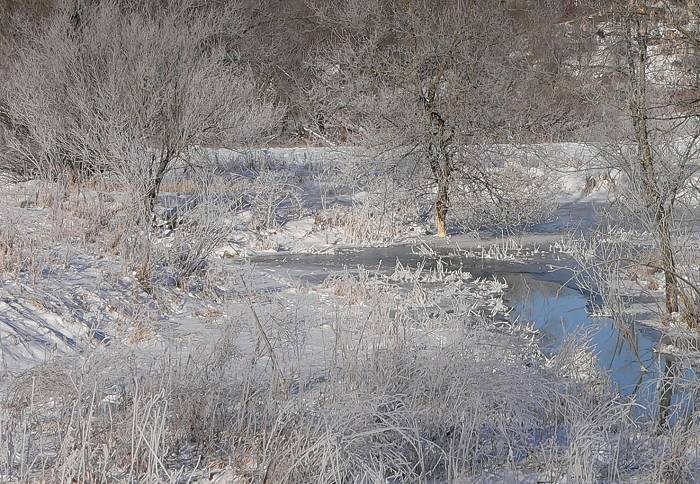 When it gets very cold, the beaver’s lake freezes over. 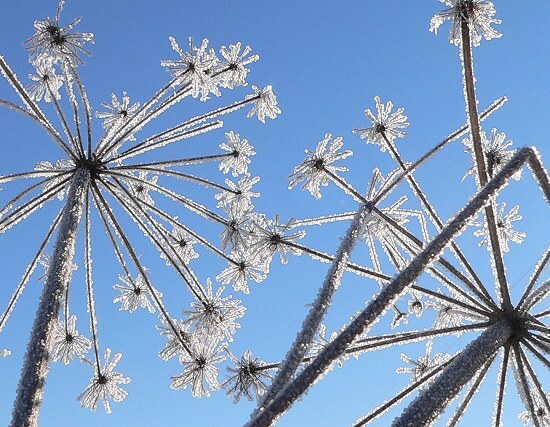 Mist rises from the creek and coats the plants along the edge with frost crystals. 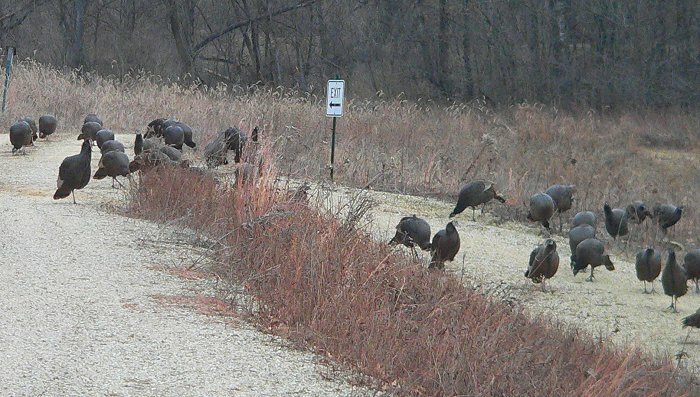 One morning we saw a big flock of turkeys beside the garage – I counted 55 birds – and I think there were more behind the building. Last weekend was the Golden Eagle count organized by Scott Mehus. I had an area that I thought I knew pretty well, but I drove through the middle of it on some roads that I hadn’t been on before, and discovered several valleys and lots of hills with bluff prairies on them. I drove and searched, both days of the count, and didn’t see any Golden Eagles in my territory. 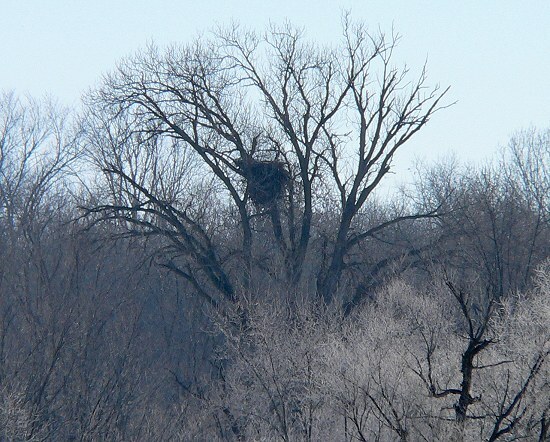 I did see a huge Bald Eagle nest along the Buffalo River – bigger than any nest I’ve ever seen. I rode down to Buffalo City with some of the other birders, so I saw some Golden Eagles on their routes. We also saw several Rough-legged Hawks, lots of Bald Eagles, Red Tailed Hawks, and a couple of American Kestrels. 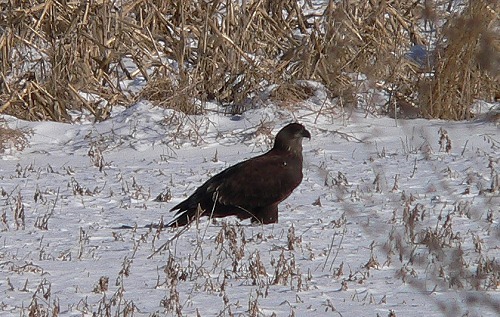 We found one eagle sitting in a field – it looked like it might be a Golden Eagle, so we were all frantically taking pictures, but then it flew and we could see from the white under its wings that it was an immature Bald Eagle. I got to see some beautiful places in Buffalo County that I’d never seen before. I read an article recently that said most of the state’s bluff prairies are in Buffalo County – it seems like every hilltop has a bluff prairie. Then on Monday – the day after the count – I saw 3 Golden Eagles flying over Center Valley.